Bob knew the importance of civil discourse and an educated electorate. He was a big fan of AM 1370 and especially 1370 Connection (now Connections with Evan Dawson). His career as a writer for the railroad industry brought him to jobs in Chicago and Washington DC. A native of Albion, he returned to the area to care for his aging parents. Bob served in Europe in World War II but didn't like to talk much about that. He did enjoy good conversation about many topics including issues that concern our community, region and state. AND always, his beloved Chicago Cubs. 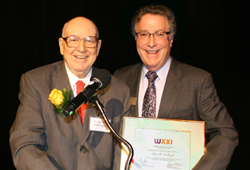 Even though we didn't air Cubs games on WXXI, Bob made a very generous bequest that will serve our community for many years to come. The conversations will continue to help foster understanding and make this a better place to live, We are grateful to Bob for his generosity and for his friendship. Click here to see Bob's video.